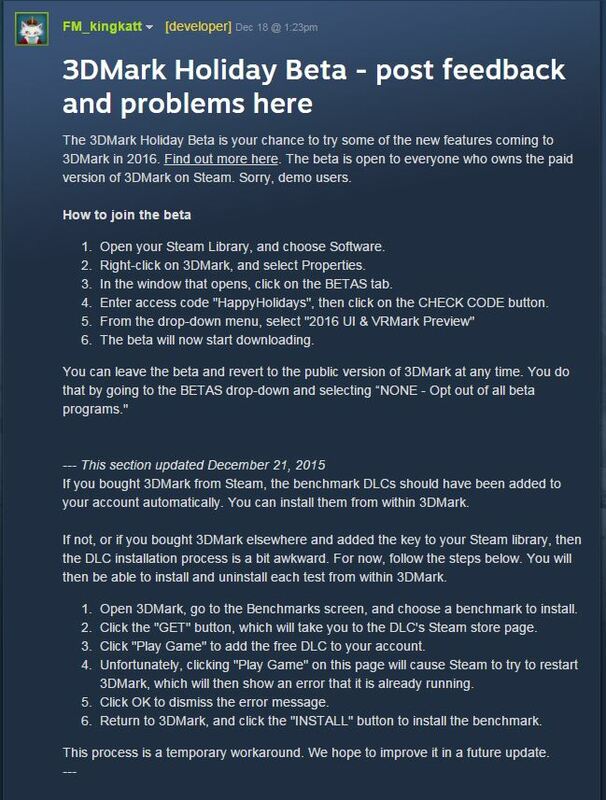 The folks at Futuremark have reached out to us once again to let us know of a new 3DMark Holiday Beta available through Steam. With this Beta you can preview VRMark, their newest addition to the 3DMark line for 2016, as well as some of the latest features and an all new interface. The preview can be run through Steam or with the stand alone 3DMark benchmark. VRMark is designed to utilize the latest VR (Virtual Reality) technologies with Oculus Rift DK2/DK1, HTC Vive and many others. 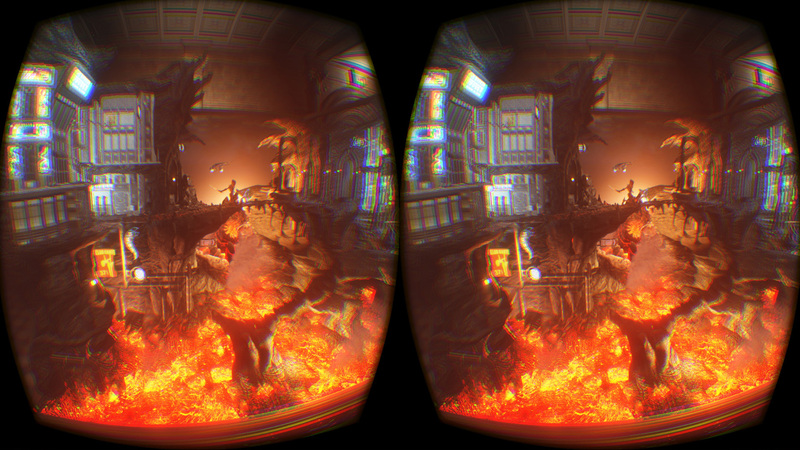 Of course you can run it with your current monitor if you don’t have a VR set. It is important to note though, that this benchmark will not run on Windows 7 as the VR drivers are not compatible. At the time of this posting Futuremark is working on adding Windows 7 for monitor use only. In addition to the VRMark preview you can also use the latest UI. According to Futuremark this new interface is designed to be faster, more flexible, and more intuitive. The home screen will now evaluate your system and recommend a benchmark based on those specs. Here you can see my current rig, an i7 4790k at 4GHz with 8Gb of ram and an AMD 7900 series GPU. The recommended benchmark for this system is Fire Strike Ultra. Having the benchmark choose an appropriate version for your system will be beneficial for those not familiar with benchmarks. But for the enthusiasts that frequent Overclockers.com this recommendation can, for the most part, be disregarded. 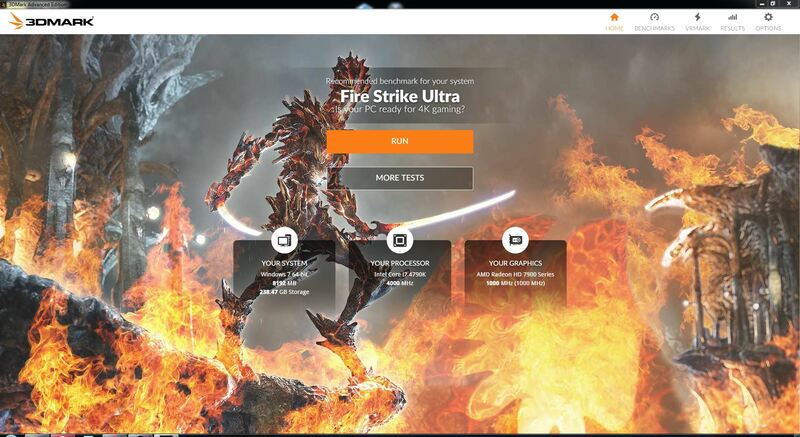 As far as installing the Beta please refer to 3DMark developer FM_Kingkatt’s tutorial here. I’ve included a snapshot of the directions but these may change in time. Also there are some known issues listed in their post so be sure to read them if you have any problems with the install or running it.